I wrote about how to use social media to be a tornado relief hero - we can all use our influence to help tremendously!! While we're all praying for our own state, please also add prayers for those along the Mississippi River. Thanks! So happy to discover this blog this week! I chose "Letters from my mom" to share because I'm struggling with my first Mother's Day without my mom. This post just highlights some of the thrift store goodies I brought home this week. I really felt like I needed a few laughs after this last week and I knew I couldn't be the only one. Mother's Day is just around the corner and my most consistent source of laughter is my daughter so it just made sense to ask other mom's to share their funniest kid stories. I'm coming to Bham in June! Yay! I posted my most recent blog titled Walking through Disaster. It's my take on what I've seen over the last week. And I added links on how to get involved. 12. Wade Kwon.com - A report from our Ground Zero after the tornadoes. 13. Wade on Birmingham - Nearly 300 newspaper front pages from across America showing how the Alabama tornadoes played out. 14. Magic City Post - What next for Birmingham in the rebuilding process. I wrote about how the storms have changed how we re-act to weather warnings. 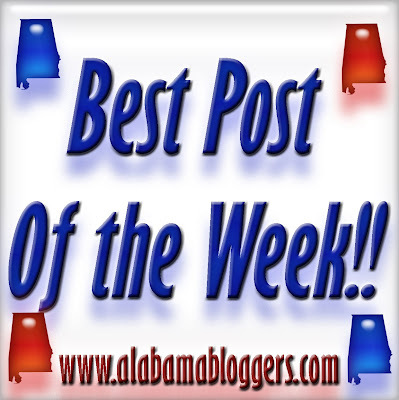 Best Post of the Week: Week One Hundred! See Jane Tweet - Rescheduled! Food Blogger Bake Sale this Saturday!! ALsocme: How to Deal with Negative Commenters.